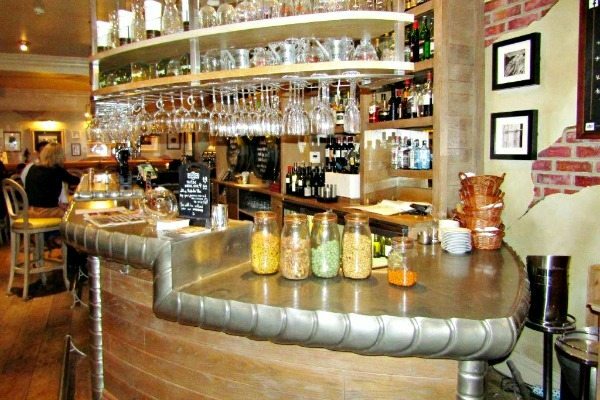 Next door to the fabulous Hotel Du Vin, at the sea front end of Ship Street in the Lanes, is its more laid-back younger sibling, the Pub Du Vin. 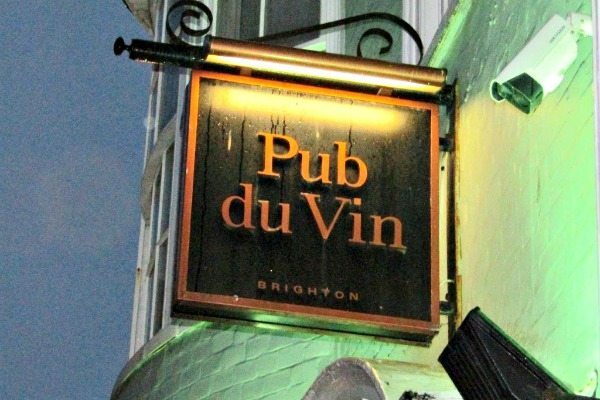 The Pub Du Vin aims to combine good old-fashioned pub atmosphere with contemporary British food and traditional pub classics, alongside local and craft beers, guest ales, cocktails and, of course, the fruits of the substantial cellar next door. 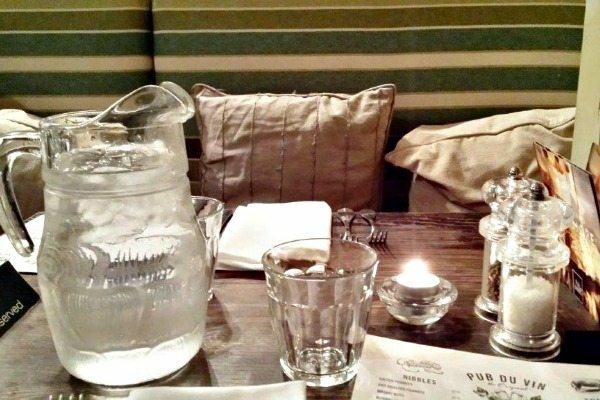 The décor is cosy but classic with wooden floors, pre-loved wooden tables and comfy upholstered wooden chairs and banquette seating. 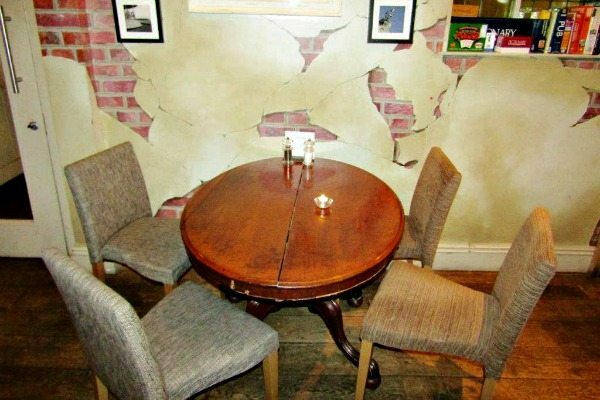 The walls are decorated with wallpaper that gives the impression of bare bricks showing though crumbling plaster, which is in turn liberally covered with fabulous photographs. The bathroom, which is down a rather spooky corridor, has cute little tin bath basins and lush lemon-scented hand wash and hand cream. 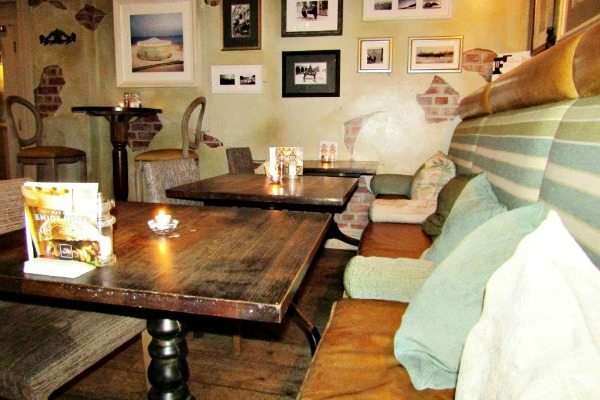 Overall there is a hushed vibe, which is accentuated by quiet, chilled music, so it feels a little more serene and upmarket than your average Brighton boozer. Having a couple of mutts ourselves, we were pleased to note that it is also dog-friendly. Whilst we chose our meals I ordered a glass of dry, refreshing Sauvignon Blanc viognier and Andrew went for a pint of smooth, light, Keepers Gold from the Sussex-based Hurst Brewery. For his starter Andrew went for an old favourite, the prawn cocktail, and I was tempted by the charcuterie plate. My charcuterie plate was a board loaded with generous amounts of cured meats and pickles. I would say it was more of a platter to share between two than a starter for one. Fortunately, Andrew was willing and able to assist. On the board was Turner’s Bresaola (Bresaola, or in Italian dialect brisaola, is air-dried, salted beef that has been aged two or three months until it becomes hard and turns a dark red, almost purple colour), which was very lean and had a slightly sweet flavour. 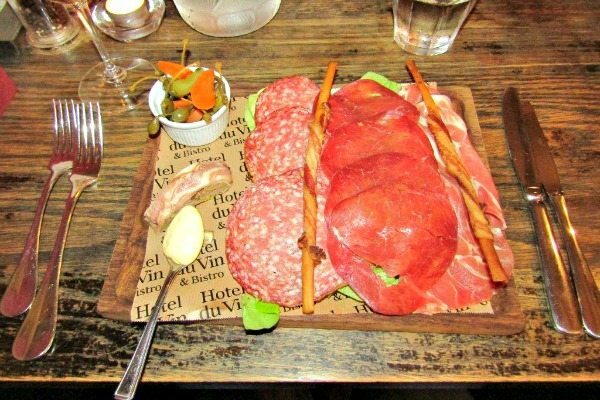 There was also a delicious Milano Salami, two pencil-thin breadsticks wrapped in bacon, and Bayonne ham, an air-dried, salted ham that takes its name from the ancient port city of Bayonne in the far South West of France. Finally, there was a lovely little slice of meaty ham-wrapped terrine, speckled with pistachios and peppercorns. All of which was served on a layer of palate-cleansing, juicy, crisp, fresh lettuce. It was accompanied by a little bowlful of pickled capers, which were big, fat, juicy and still on the stem, and sliced cornichons and carrots. The pickles were so sharp they left you with a comical involuntary squint. The platter was completed with a spoonful of smooth, rich Dijon mustard. For our mains we had the Chicken Tikka Masala and the Lancashire Cheese and Onion Pie with Mushy Peas and Mashed Potato Gravy. 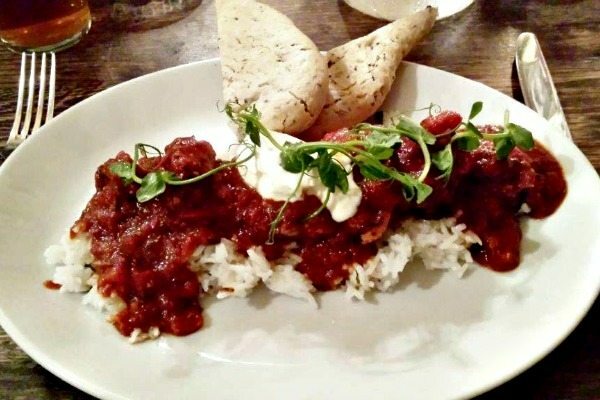 The chicken tikka masala came with plain white rice, a lovely thick aromatic bread and a healthy dollop of cool crème fraiche and was garnished with pea shoots. The curry itself was packed with pieces of succulent char-grilled chicken, was rich with tomatoes and was delicately spiced so as to be mild enough to appeal to all palates. My individual cheese and onion pie was generously stuffed with a delicious tangy, cheesy filling and encased in lovely golden shortcrust pastry. 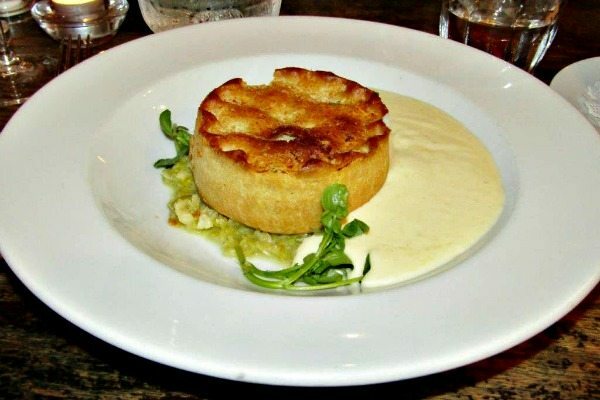 The pie sat on a bed of crushed marrowfat peas, which were more al dente than mushy and garnished with lamb’s lettuce. I had misunderstood the menu and expected mashed potato and gravy but what I was served was a gravy boat filled with “mashed potato gravy”. In other words, mashed potato that was liquid enough to pour from a jug. It tasted pleasant but it was a rather odd consistency. Bring back the honest to goodness mash and gravy! 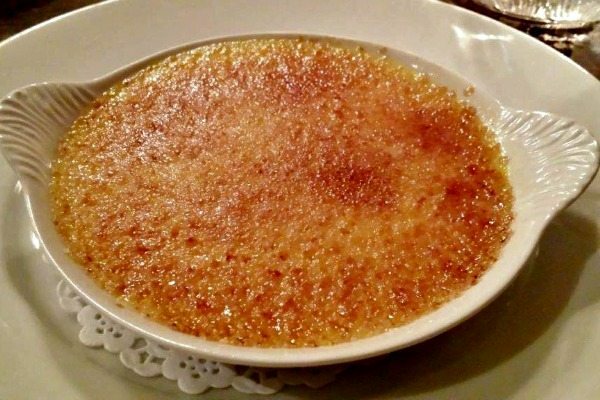 For dessert Andrew had the Cambridge Burnt Cream, a large bowlful of luscious, sweet, smooth set cream, loaded with real vanilla and topped with a crispy, golden, burnt sugar crust. I went for the Pub Du Vin Profiterole and it was enormous! Definitely a pudding to share. 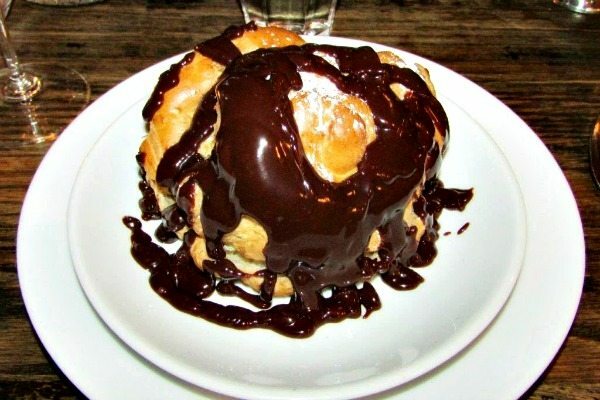 The gigantic choux pastry was golden and crisp and filled with a dollop each of very sweet vanilla, chocolate and hazelnut ice cream. I also got a generous jugful of beautiful decadent, thick, glossy chocolate sauce. Needless to say we both left utterly stuffed. 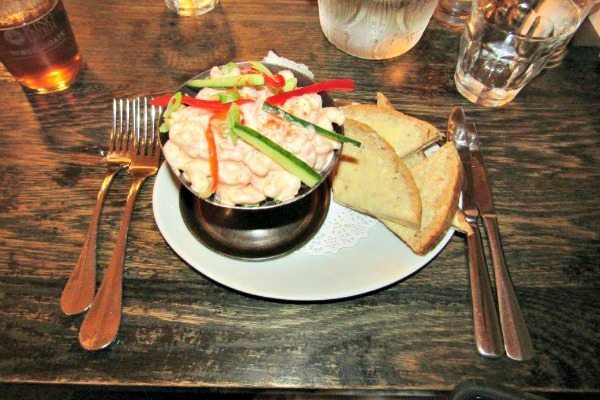 You can get a “big plate” or pie with a glass of Hotel du Vin Chardonnay or Merlot, or a pint of selected lager, stout or cider for £12.95, Monday to Friday and Sunday lunches are available from midday.